There’s reason to believe Chris Sale will have a good postseason. Almost every year, one or two pitchers seem to take over October and almost single-handedly spur their teams to victory. In 2014, Giants starter Madison Bumgarner capped one of the best postseason performances in history with an unforgettable World Series Game 7 relief appearance. Last year, the Indians’ Corey Kluber led the way, allowing only seven runs across more than 34 innings. A few weeks ago, we showed that hot streaks like these can arise from pitchers throwing harder than normal. Add a couple ticks to an ace’s fastball, and he can go from normal, everyday excellence to almost superhuman levels of greatness. But the effect goes beyond mere velocity: Hot streaks can tell us when to expect a significant boost to a pitcher’s entire statistical profile, which can come in especially handy during the notorious crapshoot that is the MLB postseason. A lack of reliable metrics stymied many previous efforts to study the hot hand in baseball. Noisy measures of performance like ERA and on-base percentage can have just as much to do with the team a pitcher is facing or the fielders behind him as they do with his innate talent. By zeroing in on the one thing a pitcher has absolute control over — his fastball velocity — we could see when he was running hot or cold. A pitcher’s ups and downs become even more important in October. A 1.02-run drop in a couple of starters’ ERAs can mean the difference between an early wild card exit and making the World Series. And fortunately for playoff-bound aces, when we looked at the last three postseasons’ worth of data,6 we found that a pitcher who ends the regular season hot is likely to carry that momentum into the playoffs. The list of pitchers who were running hot going into the postseason reads like a who’s who of great recent playoff performances. The aforementioned Bumgarner makes two appearances, once in 2016 and again just before his overpowering 2014 run. Last year’s Kluber performance was there, alongside somewhat unexpected performances like the 2015 Blue Jays’ Marco Estrada and 2014 Cardinals’ Lance Lynn. This year, there’s no shortage of starters riding hot streaks into the playoffs.9 In fact, the Cubs (John Lackey), Yankees (Luis Severino), Red Sox (Chris Sale) and Astros (Dallas Keuchel) all enter the playoffs with a pitcher boasting higher than average velocities — and each one of these guys has the potential to take over a series. One team does stand to lose more than any other, and that’s the Dodgers. With Kershaw and Rich Hill both on cold streaks, two of L.A.’s best starters might struggle this October.10 Kershaw’s struggles are nothing new, but the persistent loss of velocity he seems to have experienced each of the last three years suggests that he’s not a choker — he’s probably just tired. To measure the possible impact of these streaks in the upcoming playoffs, we re-ran FiveThirtyEight’s Elo-based prediction system for the last three years’ regular seasons, adding the hotness of each pitcher in a matchup to the analysis. Across 1,621 games, when one starting pitcher was hot and his opponent was cold, his team was eight percent more likely to win the game than it would be if both pitchers were hot or both were cold, which is roughly twice the benefit of having home field advantage compared to playing at a neutral site. If two otherwise evenly matched teams go head-to-head and one has a hot starter and one has a cold one, the hot starter’s team will win at about the same clip as the 2017 Red Sox did. Of course, knowing that a pitcher is hot isn’t a secret sauce for predicting the playoffs. October is so random that an ice-cold hurler could muddle his way to victory, and all it takes is one misplaced pitch to turn an ace’s fiery start into a blowout. 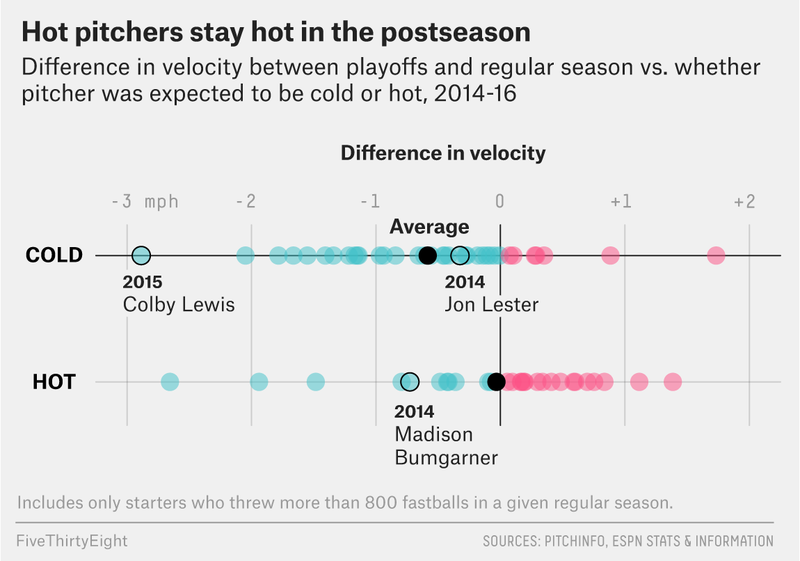 For example, last year, every pitcher in the Chicago Cubs’ rotation entered the playoffs in cold mode and throwing more softly than normal. That didn’t stop the Cubs from claiming the title, although it was arguably a little more difficult than the projections expected. So although the Dodgers have some reason to worry, they might still be able to claim the trophy. CORRECTION (Oct. 2, 8:10 p.m.): A previous version of the table in this article reversed the numbers in two columns — average fastball velocity and velocity of last five fastballs — for Kyle Hendricks and Drew Pomeranz. The table has been updated. Provided to us courtesy of Rudy Gamble of Razzball. As in our last article, we analyzed only pitchers who threw at least 800 fastballs in a season. To minimize overfitting, we ran the model for the first two months of the 2016 season and then used the Viterbi algorithm to predict starts beginning in June. We also tried looking at the last 10 and 20 pitches of the previous start, and we obtained similar results with those methods. After making a Bonferroni adjustment, we found the differences in strikeouts and ERA are significant at the standard 0.05 level (with adjusted p-values of 0.003 and 0.044), while the differences in WHIP are significant at the less stringent 0.10 level (with an adjusted p-value of 0.099). According to a binomial logistic regression, which used game location, pitcher, catcher, the count, pitcher handedness, pitch position in the strike zone and velocity as predictors. We didn’t have pitch classifications for the postseason, so we compared the velocities of pitches in the 99th percentile for speed in both the postseason and regular season. All pitchers lost an average of 0.29 mph per fastball in the postseason. The correlation was 0.25, with a p-value of 0.02. An important caveat is that pitch-tracking technologies that MLB uses switched from Pitchf/x to Statcast this year, so the results from the last three years may not match up as well with what happens this season. The Dodgers’ Alex Wood is also on a cold streak, but it’s less clear whether he will make the playoff rotation.